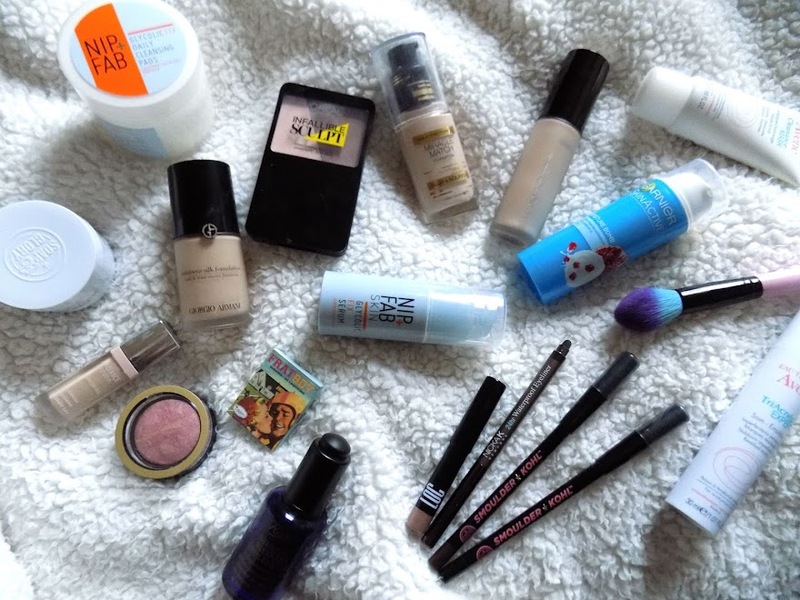 Starting first with makeup, I have quite a lot, to make up for last week when I barely wore any makeup at all. Up first is the foundations I have been really loving, and they are the Giorgio Armani Luminous Silk Foundation with The Body Shop Lightening Drops and the Maxfactor Miracle Match Foundation which I either mix together, or on it's own. The Giorgio Armani is long wearing, has really great coverage and gives a beautiful finish. 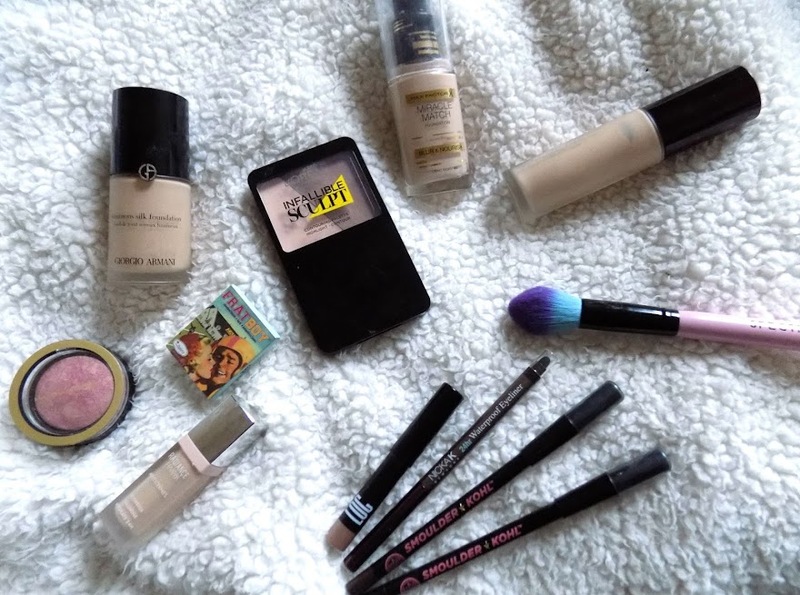 The Maxfactor is a fairly new foundation and although it feels quite thick when you first pump it out, I actually really like how it feels and the coverage, whether I use it on it's own or mixed with something else. Of course the Becca BackLight Priming Filter is still up there in my favourite primer. I've been using this everyday and I really do just love it. I love the finish, the glow it gives, I don't love the scent but that's the only thing that puts me off. I have been using the Bourjois Instant Radiance Concealer as some extra coverage under my eyes. I really like how this looks too. It doesn't crease, it doesn't feel or look cakey and although it's radiant and hydrating, it lasts really well under the eyes. I have been really in to cream contouring this week, mainly down to the L'Oreal Infalliable Sculpt Contour Kit - Cream to Powder Contour Duo, this is a new product that I've been trying this week and I have just been using the contour shade out of the palette and contour with it and because it's a cream to powder product, it pretty much sets itself and doesn't require any further maintenance. I really like this, and although it's a bit warmer than my regular contour shade, I think the product itself is really good and I am definitely going to be trying more from this new range. I am still loving the The Balm Frat Boy Blush as it's such a pretty rosy pink shade. I have been mixing it with the Maxfactor Creme Puff Blush in Seductive Pink for a little bit of a glow and it's a really pretty pink flush. I have a new favourite brush ever. The Spectrum Brush that was in this months subscription box. This is a super soft tapered brush and I think it's the perfect brush. It's travel-friendly, it has so many different uses it's crazy, plus, look how fricking adorable and beautiful it is. I love this and I have mainly been using it for highlighter and to set my makeup slightly. On to the eye products I've been loving and I am still obsessed with the LOC Eyeshadow Crayon in Champagne Problems and the Nicka K 24hr Waterproof Dark Brown Eyeliner which are both also from subscription boxes. These have been y go to products this week for a simple, don't need to think about it look and I will be doing a post on said look too. The Soap & Glory Eyeliners in Black and Brown continue to amaze me. I have really been loving having the brown one smudged into my lower waterline/lash line and the black is great for tight lining. They are super pigmented and waterproof so they last all day on my waterline although they do smudge slightly. On to skincare and the first product is the Avene Cleanance Mask-Scrub. This is magic in a bottle. It smooths out my skin, it gets rid of blackheads and breakouts and it's generally just a great product. The Avene TriAcenal Expert is something I've been trying out for the last few weeks, as they re-forumlated my trusted TriAcneal and I am really digging this new formula. I apply this every night before I go to sleep and any spots reduce dramatically overnight, and my skin feels so much smoother. 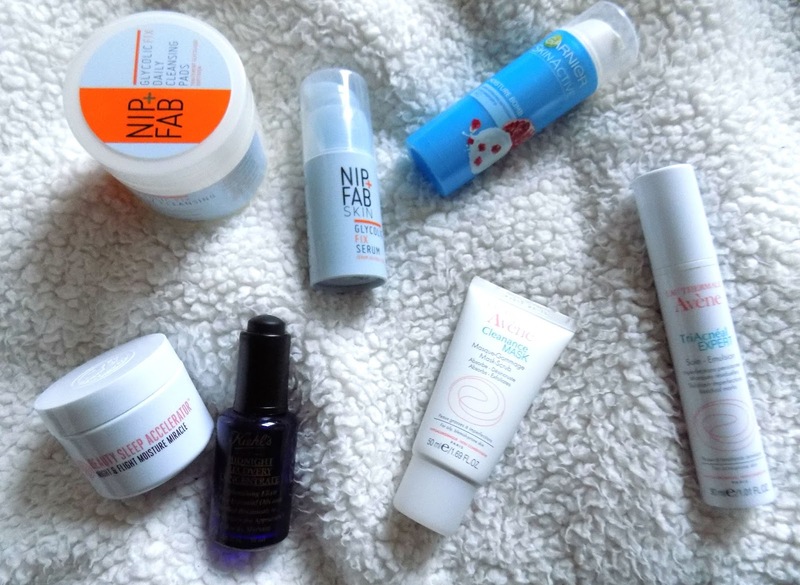 But, my smoother skin texture is also thanks to the Nip + Fab Glycolic Fix Pads & Serum. These are incredible too. Chemical exfoliants which slough away dead skin, refine the skins texture as well as reducing the appearance of pores and dark spots. I love these and I'm keen to try more from this range and from the brand. To add some extra moisture because of all the AHA's and BHA's that I'm using in my skincare, I have been mixing the Soap & Glory Beauty Sleep Accelerator Moisturiser with the Kiehls Midnight Recovery Concentrate and boy has it made a difference. My skin feels so soft and smooth and looks healthy in the morning. I love these products on their own, but combined, they're incredible. Finally for skincare and to continue with the moisturising is the Garnier Moisture Bomb Moisturiser. Now this is a new product which I have been trying out for the last few weeks and this is the daytime one with SPF 10. It's super hydrating but light so it's great underneath makeup and it makes my makeup go on a lot smoother and doesn't get greasy through the day. They do have a nighttime Moisture Bomb which is nice, but I haven't really tried that out properly yet. Alright that's it for the beauty products. Now for the extra bits and last weekend I went to go and see the new Deadpool Movie, with Ryan Reynolds. It's amazing, it's hilarious and just such a well made movie. I love it and I would happily watch it over and over. Definitely recommend going to check it out. I've been getting in to Anime shows recently, thanks to my geek of a boyfriend. So this week I watch the Seven Deadly Sin, which is a great, easy to watch show. They have two seasons on Netflix but I don't know if there's anymore out that you can find online, but I would happily watch many more episodes of that show. Then on Thursday I started watching Fairy Tail which I have to say is very similar to Seven Deadly Sins in that it's about a group of wizards who fight the baddies. There's over 200 episodes of this so this one will take me a bit longer to get through but it's a funny show and great characters. I wanted to mention the posts I have uploaded this week. I've been working on the Cruelty Free Beauty Products post and list for a while and this week you guys seemed to really like it. It got a great response and so did the Non Cruelty Free post and list. I'm glad you all liked it and I would love for any recommendations or alternative brands for the lists. Let me know. I know this has been a long, slightly rambly weekly round up. To make sure you don't miss out on any posts then you can follow me on Instagram where I post about my blog everyday. You can follow me here.